Throughout May we are seeing a significant trend where wait times are dipping lower than usual in the middle part of the week. Last week we saw crowds dip low on Tuesday through Thursday but otherwise hitting crowd levels in line with historical averages for May. 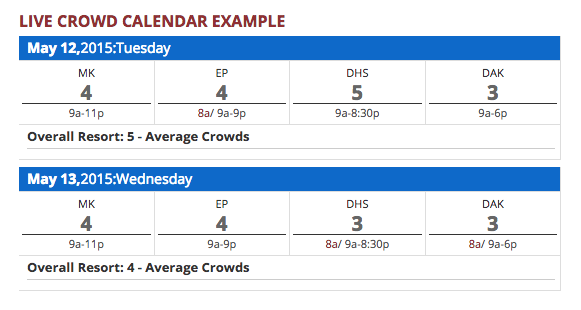 Other than those middle days the Disney World Crowd Calendar did a fine job predicting crowd levels at all four parks. Sunday’s crowd levels were low at all parks except Animal Kingdom which spiked to a surprising level ‘9’. The calendar had predicted Animal Kingdom would reach a level ‘7’ thanks to its hosting Extra Magic Hour morning. Three headliner attractions hit average waits above 50 minutes: Expedition Everest (57); Kali River Rapids (55); and Kilimanjaro Safaris (54). Monday’s predictions hit the mark at Magic Kingdom and only missed by one level at the other three parks. Epcot had the lowest crowd level as predicted. There we saw averages of 16 minutes at Living with the Land and 63 minutes at Soarin’. Tuesday was the first day we saw wait times dip significantly lower than predicted, especially at Animal Kingdom. Hollywood Studios was the lowest crowd level as expected. Magic Kingdom’s busiest attraction was Peter Pan’s Flight with a 57-minute average. 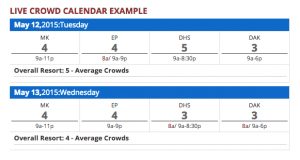 Wednesday’s crowd levels represented the lowest of the week as predicted by the Crowd Calendar. Hollywood Studios even reached a level ‘1’, only the second time any park (unaffected by weather) did that since January. Thursday we saw average waits like 36 minutes at Splash Mountain, 56 minutes at Soarin’, 58 at Toy Story Midway Mania and 22 at Expedition Everest. Friday’s wait times creeped a little higher than what we saw between Tuesday and Thursday. Splash Mountain averaged 44 minutes, Soarin’ 75, Toy Story Midway Mania 60 and Expedition Everest averaged 26 minutes. Relatively low wait times for a weekend last Saturday. We saw all parks expect The Studios hit a level ‘5’ on our scale. Big Thunder Mountain Railroad averaged 32 minutes (predicted 28) while Rock ‘n’ Roller Coaster averaged 43 (predicted 61). How Crowded is Disney World? Memorial Day is arriving at the end of the month but until then we expect Disney World guests to experience relatively moderate crowds at all four parks, especially during the week.